I've just finished the first draft of a new Duality audio file importer plugin. As you may know, Duality is currently limited to loading OGG Vorbis audio files. This project aims to extend the number of audio formats supported by implementing an editor plugin which fits into Duality's normal asset importing workflow. 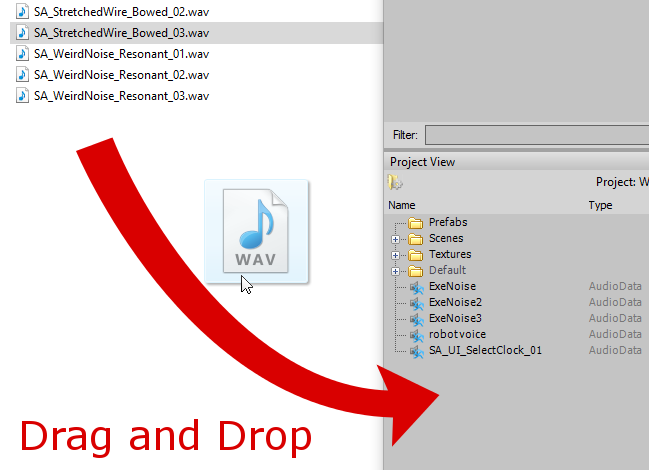 Simply drag your audio files into Duality's Project View window. More formats may be supported in the future. 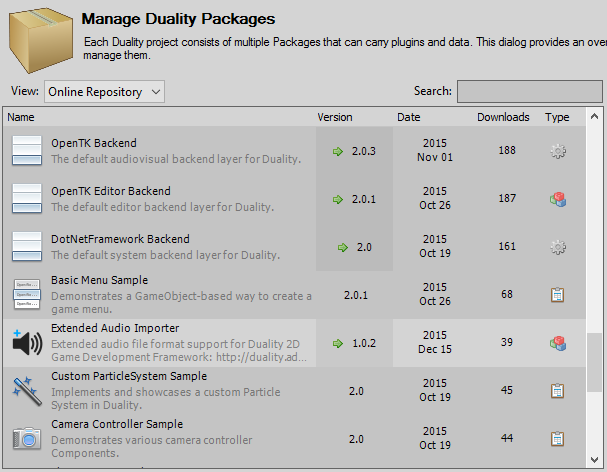 ExtendedAudioImporter can be installed via Duality Editor's built in package manager. * Change the package view to "Online Repository"
* Search for "Extended Audio Importer"
Last edited by importjingles on 2015/12/15, 12:33, edited 2 times in total. looking forward to testing it out. Looks well done and properly executed! Hey thanks! That's good to hear. * Sensible way to report exceptions back to Duality. Currently I'm just letting them fly (I haven't read the Duality importer code much yet). * Whether it can be released under MIT license (considering libsox is LGPL). I haven't used the plugin yet, but here's a feedback (more of a personal opinion than an actual feedback): IMO the plugin should be named "Extended Audio Importer/Handler" instead of prefixing it with "Duality". It's a bit redundant . Regarding the license, here's an answer that might be what you're looking for. I'll look forward to use this plugin in my future projects! The name change makes sense, I'll fix that up. I wasn't sure how packages were identified so I prepended the word Duality everywhere, but I can see now it wasn't necessary. Thanks for the google search on the license. Legal stuff makes my head swim. Said it on GitHub, I'll say it again here: Didn't get around to test it yet, but this looks really good. Keep it up! I'm sure this will come in handy for a lot of users. In general, if your code crashes in an unexpected way, Duality will try to catch it and report back to the users, which will then come complaining to you, so you can fix the underlying problem. If your code fails in an expected way, you should generally try to fail gracefully, but importers are a special case: Duality actually watches each of them closely and handles their exceptions as an expected failure case, which is logged and later reported to the user. So you can actually throw an Exception there and it will be fine. If you expect something bad to happen at some point out of your control, it's still a good thing to detect it first and do something about it yourself though. Prefer failing explicitly. Whether it can be released under MIT license (considering libsox is LGPL). I think, as long as you're only using its binaries, but do not include any of its source code, this should be fine - but this legal stuff really isn't my specialty either. RockyTV's link looks quite good and seems to have a similar gist. Groovy. Having read that, I think exceptions are fine in this case, and I'll try to make the exception info a bit more informative. There are a couple other code design related things I wanted to talk about elsewhere. Perhaps I can grab you for a chat in the new year after this christmas madness? To everyone else: If I've missed your favourite audio file format, and it's common enough, then give me a shout via GitHub and we can decide how much work it would be to implement it. Some may be easier than others. Have fun making game audio! There are a couple other code design related things I wanted to talk about elsewhere. Perhaps I can grab you for a chat in the new year after this christmas madness? Sure, we can set something up. Just remind me with a forum PM next year, I have a bit of real life stuff going on and might forget otherwise.